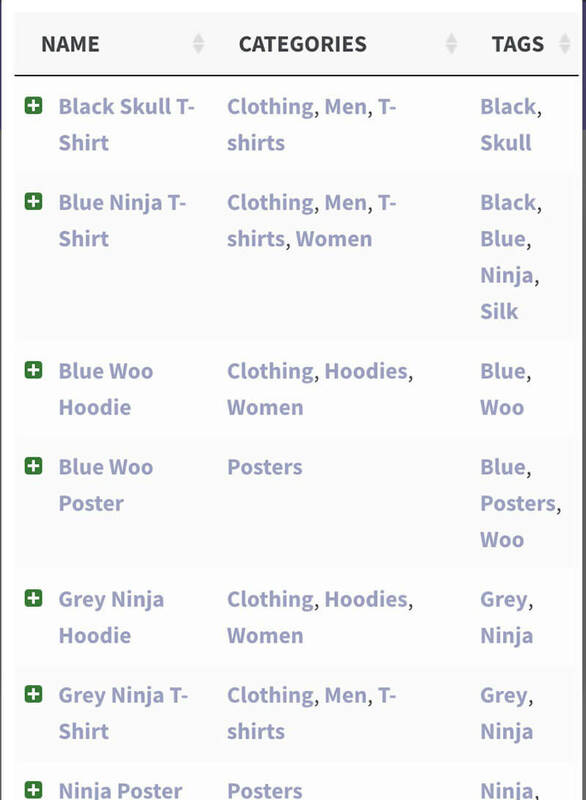 WooCommerce Product Table comes with several options for controlling how the tables behave on different screen sizes, for example mobiles and tablets. 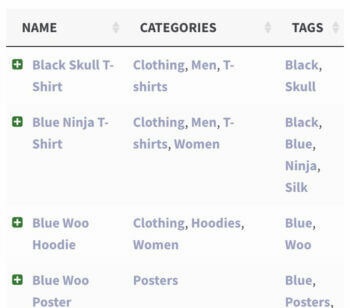 The options on this page are controlled individually in the shortcode for each product table, and do not appear on the plugin settings page. The wrap option tells the table whether to wrap long content onto multiple lines, or to keep everything on a single line and hide the rest. The default is true which means longer content will “wrap” onto extra lines as needed. Setting this to false will ensure that each row is exactly one line high. Text wrapping set to false - each row takes up 1 line, and any rows that don't fit are hidden. You can click to view the hidden content. The priorities option is only relevant when displaying the table on smaller screen sizes (mobiles, tablets, etc) or when you have a lot of columns in your table and the plugin can’t fit everything in. When the screen size gets too small, the plugin will collapse certain columns down so they are no longer visible, and a “+” icon will appear at the left of each row. This allows the user to expand the row to show its full contents. 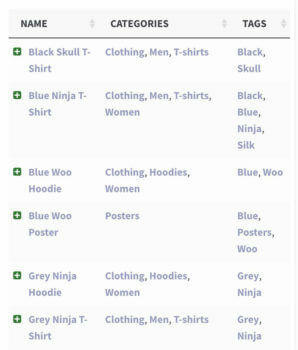 Priorities are used to determine the order in which columns are “collapsed” on smaller screens. 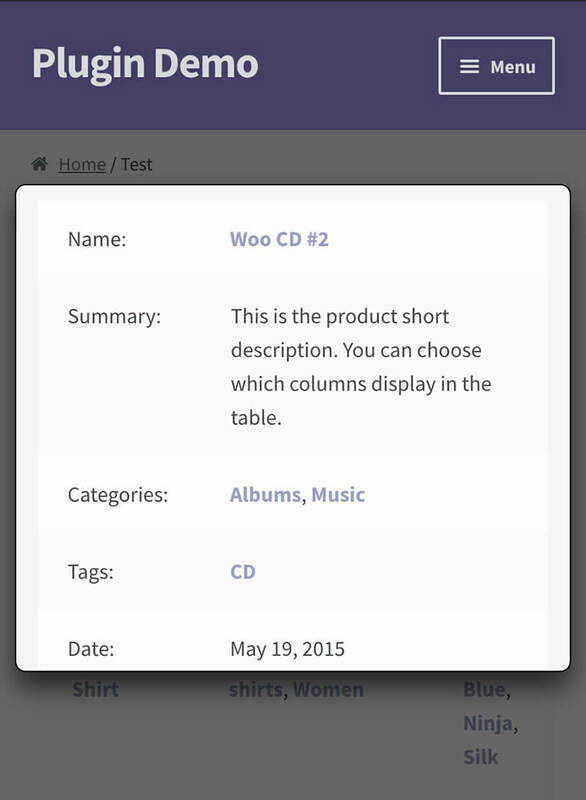 WooCommerce Product Table has some default priorities are used and this option lets you override them. The lower the number, the higher priority that column has. So a column with a priority of “1” would have the highest priority and be collapsed last. The column_breakpoints option gives you fine-grained control over the when each column is displayed at different screen sizes, and when it is collapsed into the hidden ‘child’ row (or modal window). This works in tandem with the response_display option, but will override anything set by the priorities option (i.e you can use column_breakpoints or priorities, but don’t use both together). 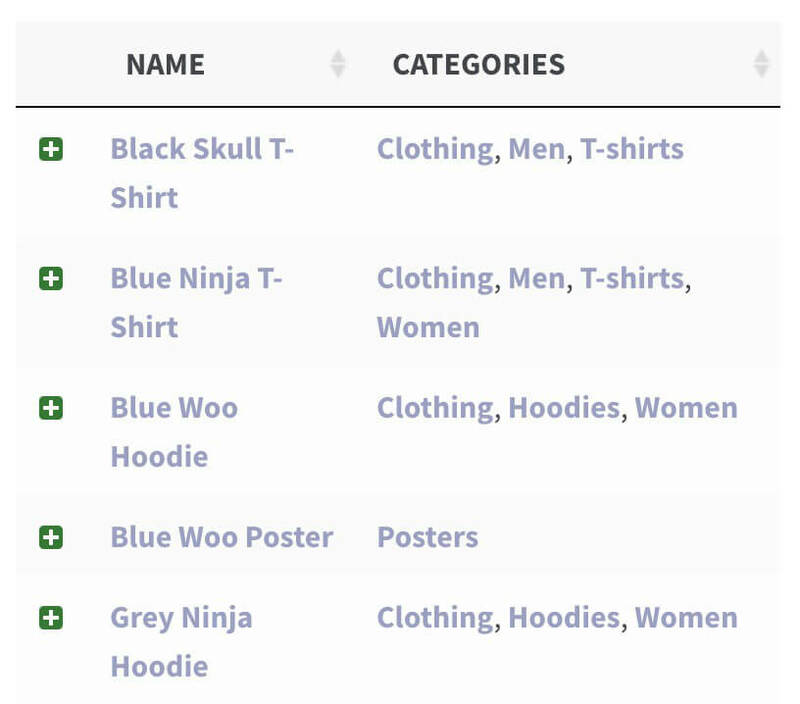 By default, WooCommerce Product Table will show or hide columns on smaller screens based on the priorities option described above (using the default priorities if none are set). If you wish to set more specific breakpoints, you can set one of the options below for each column in your table. For example, setting a breakpoint of tablet for a column means it will display on tablet devices, but will appear in the child row on mobiles and desktop screens. default – let the table decide when to show the column, using the priorities option if set. mobile – column will always display on mobiles, otherwise collapsed. tablet – column will always display on tablets, otherwise collapsed. desktop – column will always display on desktop screen sizes, otherwise collapsed. not-desktop – display on mobiles and tablets, collapsed on desktops. 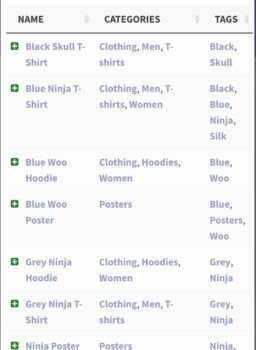 not-mobile – display on desktop and tablets, collapsed on mobiles. not-table – display on desktop and mobiles, collapsed on tablets. all – force the column to display at all screen sizes where possible. If using this option, you should set one choice for each column in your table. Set the breakpoints in the order they are defined in your columns option. So in this example, image and add-to-cart will have the default option, price will have desktop option and stock will have the all option. Do not list column names in the column_breakpoints option. Just list the visibility for each column in the correct order. The plugin can only display columns that physically fit into each screen size. The column_breakpoints option will be ignored if the columns that are set to visible do not fit on a specific screen size. For example, if you have 20 columns and set them all to all then some of them will still be hidden. We have coded the plugin this way to prevent it from ever looking broken on any screen size. I’ve hidden the first column and it’s not working! By default, it’s not possible to hide the first column in your table because the expandable + plus icon is contained within the first column. If you need to hide the first column, then you’ll also need to use the responsive_control option to put the + plus icon in its own column of the table. 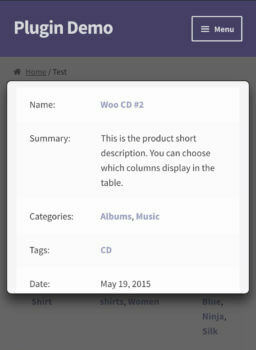 When the plugin can’t fit all the data within the space available (for example, on mobile devices), a “plus” icon appears to the left of each row to allow the user to show or expand the full content. The responsive_control option sets whether the “+” icon control is displayed inside the first column (responsive_control="inline") or within its own separate column (responsive_control="column"). Defaults to inline. child_row – the default option. Extra data will be displayed in a hidden child row. child_row_visible – Extra data is displayed in a child row which is expanded automatically when the table is first viewed. Warning: The ‘checkbox’ add to cart button style is not compatible with the modal window option. This is because multi-select checkboxes can only appear on a single page, and not within separate modal windows. 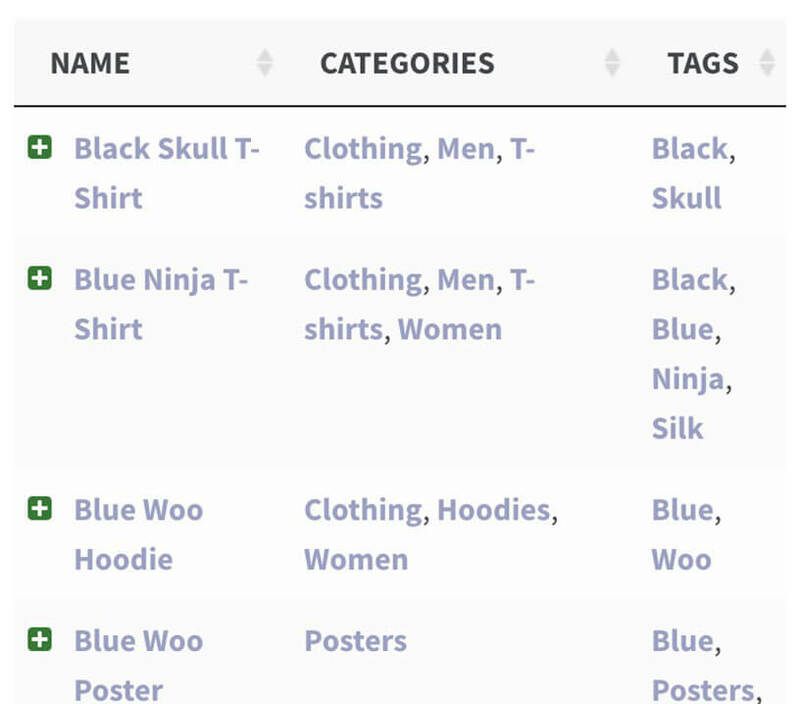 If you’re using the ‘modal’ option then we recommend using the ‘button’ or ‘button_checkbox’ options so that mobile users can still add your products to the cart. Troubleshooting – Why can’t I hide the first column of my table? If the above options aren’t working when you try to hide the first column of your table on smaller screens, then this is because the first column also contains the + icon. This is needed to let users reveal the hidden child row, so you can’t hide the first column in this case. 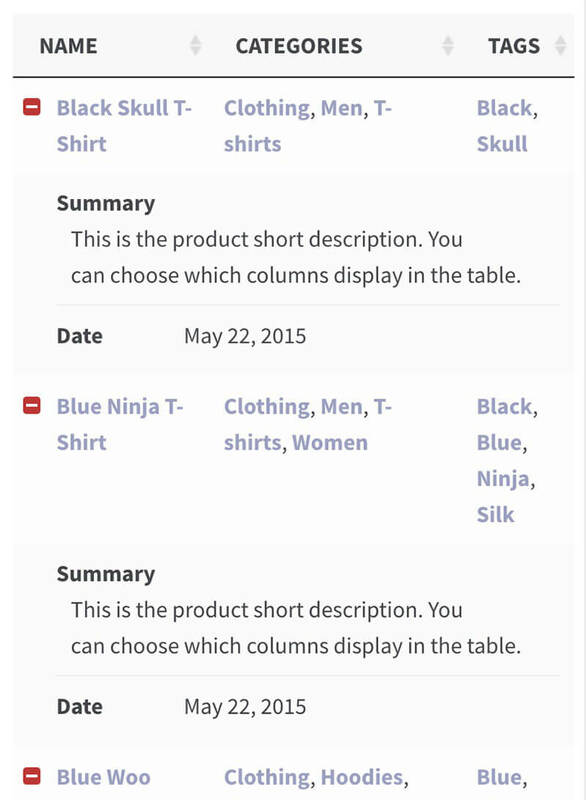 To fix the problem, add responsive_control="column" to your product table shortcode. This will put the + icon in its own column so that you can successfully hide the first column. FAQ – Can users click on the first column to open the hidden child row instead of the + icon? Yes, you can do this by disabling the link to the single product page in the first column. 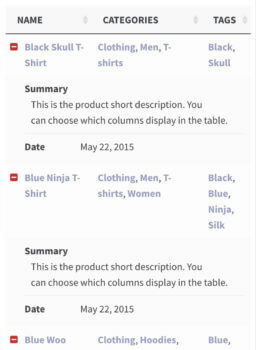 If the first column does not link to the single product page, then users can click on it or the plus icon to open up the hidden child row. Please note that this will only work if the responsive_control option is set to inline (the default) and not column. Not bought the plugin yet? 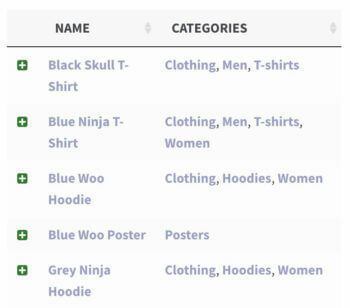 WooCommerce Product Table lists your products in a searchable, sortable table view. Are you running the latest version of WordPress, your theme and plugins? Try disabling all your other plugins and switch to a default theme (e.g. TwentySeventeen). If it fixes the problem, there's a conflict with your theme or another plugin. Search the knowledge base for a solution. If searching the knowledge base hasn't answered your question, please contact support. If the plugin is missing any options that would be useful to you, please let us know!